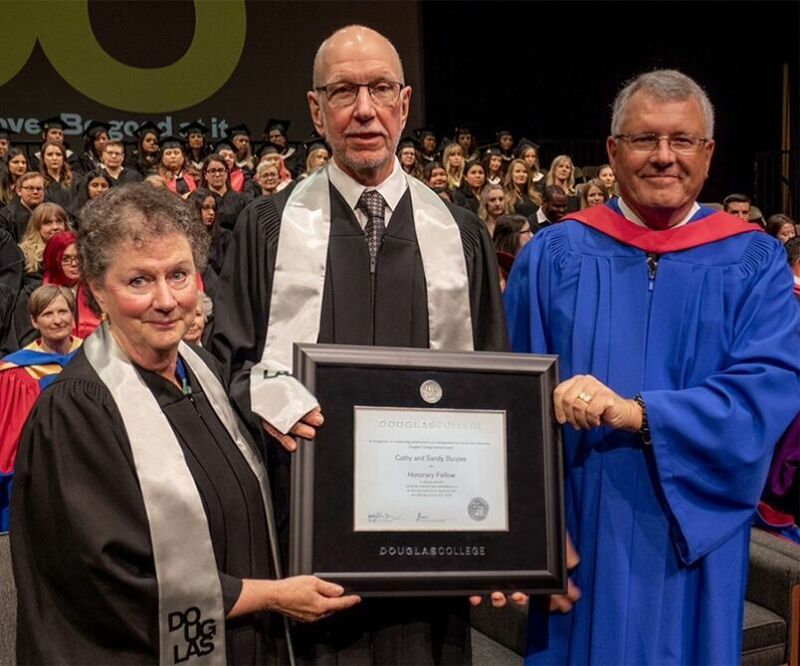 Sandy and Cathy Burpee, housing and homeless advocates from Coquitlam, were named as Douglas College Honorary Fellows June 13. Honorary fellowship is the most prestigious recognition given by Douglas College, according to a press release issued by the college. Kathy Denton, president of Douglas College, said in the press release that the Burpees are exemplary community leaders. The Burpees fought successfully for the creation of a homeless shelter in the Tri-Cities despite fierce opposition from some residents, according to the press release. In 2015, after a long battle, a shelter with 30 permanent beds and 30 transitional housing units opened in the tri-cities thanks in part to the Burpees’ hard work. The shelter is operated by RainCity Housing and Support Services. The pair also founded the Tri-City Together Against Violence committee and Sandy chaired the Tri-Cities Homelessness and Housing Task Group for over a decade. The Burpees have both received the Queen’s Jubilee Medal. Sandy is still an active poverty advocate, doing weekly needle sweeps and litter cleanup, among other things, according to a report by the Tri-City News. Cathy is focused on her role as a grandmother. The Burpees said they were delighted to be named Douglas College honorary fellows. “As the Tri-Cities’ post-secondary institution, Douglas College plays an important role in our community, stimulating minds and preparing young people for productive careers. We are honoured that our work in the Tri-Cities community is being recognized by Douglas College in this way,” they said in the Douglas College press release.